Speed is probably the most vital determinant of your tennis performance. If you can get to the ball in a good position to hit it, you stand a great chance to hit the ball well. But tennis speed is so much more than the ability to run at maximum speeds. Because of the distances covered on a tennis court it is almost impossible to reach top speed. Also, tennis is a very different discipline than, say, the 100-meter, which is what many people think about when you mention speed. The 100 meter is run in a straight line, wheras tennis involves the player making many different types of movement (not just running) in many different directions. The key to improvement in this area is to train in ways that mimic the demands of the sport for which you are training. It's a principle we call "specificity". For example, if you are a tennis player you don't want to train like a bodybuilder (an extreme example, I know, but I think you get the point). There are five keys to getting your tennis speed training right. Do these and you will be ahead of 95 percent of the other players out there. Training for tennis speed is all about maximum effort and intensity, so a proper dynamic warm-up (no static stretching in the warm up!) is essential as your muscles will be working at full capacity. The rate of muscular contraction is very high during speed training so if you don't take the time to warm up properly you really run the risk of injury. The same can be said of the cool down period after training. The excessive contractions tend to shorten the muscles and produce waste products as the session progresses, so you must perform a proper cool? down. This will help to stretch the muscles back to their original resting length and eliminate the presence of the waste products such as lactic acid. Your cool down should be similar to the warm up, except the warm up should start slowly at low intensities and build up, whereas your cool down should be the exact opposite--gradually slowing down--finishing with some static stretching. A proper warm up and cool down will also significantly reduce the amount of muscle soreness that will occur a day or so after the session. 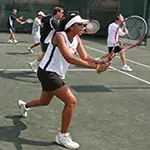 Paul Gold has been involved in enhancing the performance of tennis players of all levels from beginners to touring professionals for more than 20 years.. For Paul's free mini-course footwork video, visit footwork4tennis.com.